Sunless Tanning at Sun Tan City is your UV-free solution to get the amazing tan you've always dreamed of, instantly. Check out this month's special below to help you reach your sunless tanning goals—for less! Get a fee Sunless visit click the link below to go print the coupon. 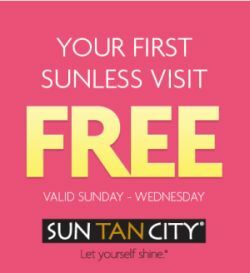 Take your coupon in to your nearest Sun Tan City to redeem. Valid Sunday- Wednesday only.